Meathead Movers is here to take care of the heavy lifting for you on your move to Cambria. Our clean-cut student athlete movers are ready to get you safely settled into your new Cambria home. 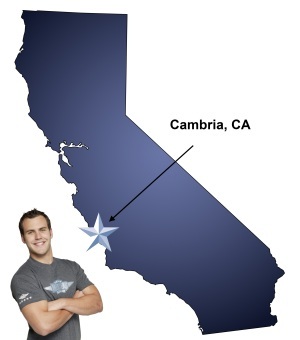 If you are moving to or from Cambria, we are the moving company for you! Our professionally trained student-athlete movers and our moving concierge service are here to help you with every stage of your move in Cambria. Situated on the beautiful California Central Coast, Cambria is a picturesque village that charms all those who visits. From scenic hikes with views of the coast and the majestic elephant seals to strolling through Hearst Castle like royalty, there is plenty to see and do in Cambria. Residents and visitors will also enjoy taking a step back in time at Nitt Witt Ridge, or finishing off their evening with fine dining and wine tasting. If you are considering calling this coastal paradise your home, Meathead Movers is here to help. Our moving company specializes in local, long-distance, and commercial moves to, from, and within Cambria. We also provide reliable packing, storage, on-site relocations, and our distinctive moving concierge service, which connects you with local service providers. All our student-athlete movers are thoroughly screened and trained before their very first move. With branches not just in Cambria, but all throughout California, we are your one stop resource for all your moving needs, no matter where your California move takes you. In fact, you can see what your neighbors in Cambria have to say about us! With our 100% satisfaction guarantee, the only thing you have to lose is the stress that comes from moving! So contact us today for a free no-obligation moving quote and to learn how we can help you on your next move! Moving to Cambria? Here are some helpful resources. The two young men were courteous, expedient and above and beyond helpful. My husband and I are in our eighties and were impressed with their respectful and considerate attitude as well as their ability and willingness to do whatever it took to get the job done. If there was a number higher than 10, they would have earned it. [email protected] you for hiring young men of such caliber. Friendly and helpful staff who do a great job. Great experience, just like before. They were done in the allotted time even when I had to have them do some extra unexpected items....(like unloading a 45 foot truck of furniture). When we placed the couch set in our home 8 years ago, it took 4 men and almost 45 minutes to get it into our living room (up the stairs). It took your two men a total of 15 minutes. They are amazing!!!! !